Inventory We are a resale marketplace, not a box office or venue. Ticket prices may exceed face value. This site is not owned by US Cellular Center . The US Cellular Coliseum is the pride of Cedar Rapids, Iowa boasting a full list of events to fulfill the most discerning fans. 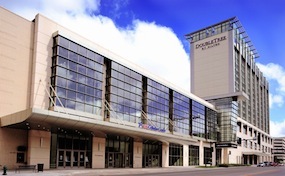 After a devastating flood in 2008 the U.S. Cellular Center was reopened temporarily then shut down in 2011. The coliseum remained closed from 2011 until 2013 when Lady Antebellum graced their doors with a grand reopening event. Since then US Cellular Center has hosted an NBA preseason game, Indoor Football, and numerous other concerts. With the ability to seat approximately 8600 fans Brad Paisley and Miranda Lambert should have no trouble selling it out. The US Cellular Coliseum is a top notch venue for a fantastic city. UsCellular.CenterCedarRapids.com is not affiliated with any primary box office or supplier. We are a privately owned and operated business specializing in sales in the secondary market. Prices on our sites tend to be above face value and will change quickly with demand. To buy tickets for any US Cellular Center events in Cedar Rapids simply click on the event of interest or call our operators at anytime.